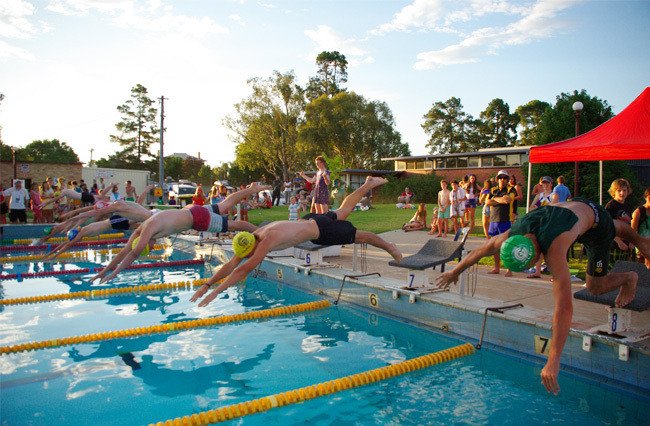 The 2013 Galen Swimming Sports were held on the evening of 19th February in hot conditions. This year a number of new things were trialled. A semi-automatic timing system was used to improve the accuracy of the timing, we held a number of different novelty events and it was great to see so many students make the effort to dress up in their house colours to enter the inaugural “Fashions on the Field” event. The standard of swimming was high, with a number of records being broken throughout the night. Emma Brown smashed the 17 year girls 50m freestyle record by over 10 seconds, whilst sister Kate Brown did the same to the 17 year girls 50m breaststroke record. Jackson Clarke, Jacob Reidy and Bridget Cole also broke the records in their age groups for the breaststroke, backstroke and butterfly respectively. The 17 year old girls 4x50m freestyle relay team from Chisholm set a new record in an impressive time of 2.55.36, 22 seconds faster than the previous record. Well done girls! The final individual event of the night was the female and male SuperSwim. 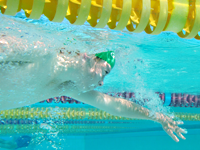 This event is a 50m freestyle event between the eight fastest females and eight fastest males of the night. Representing the females were Bridie Nixon, Bridget Cole, Kate Brown, Emma Brown, Elli Warren, Sarah Lockwood, Madison Pease and Olivia Storer. In a very close finish, Elli Warren capped off a great night by taking out the win over Emma Brown in 29.69 seconds. This is the second year in a row that she has won this event – congratulations Elli! The eight fastest males were Drew Hiskins, Ned Penny, Jacob Reidy, Mitchell Horwood, Jackson Clarke, Harrison Clarebrough, Heath Nash and Rob Carnovale. Congratulations to Mitch Horwood who won by a close margin over Jackson Clarke, also in a time of 29.69 seconds. The final event of the night was the hotly contested student/staff freestyle relay. Sadly for the staff on the night, the student team was just a touch too good for the staff. The female staff team of Carly Bilke, Jess Clarke, Sarah Pitcher and Liz Cox were, however, victorious over the male staff team of Chris Parsons, Tom Anson, Anthony Holligan and Darren Hovey. The age group champions are listed below. These are the best performers from each age group, males and females, on the night. Each age group champion will be presented with a medallion at an upcoming assembly and they should be congratulated on their fine efforts. Thanks to all staff and parents who helped out on the night and to all students for creating such an enthusiastic and fun atmosphere. Special thanks must also go to Allison King of the Parent’s Association who organized the sausage sizzle. Finally a big thank-you to all of the house captains, particularly the senior captains, who played a big role in organizing the relays, encouraging others to participate, generating house spirit, and swimming themselves.